Feel Like (Queen studio demo, 1981). Under Pressure (Bowie and Queen). Under Pressure (Queen, live, 1986). Under Pressure (Bowie and Annie Lennox, rehearsal, 1992). Under Pressure (Bowie and Annie Lennox w/Queen, live, 1992). Under Pressure (Bowie and Gail Ann Dorsey, broadcast, 1995). Under Pressure (Bowie and Dorsey, live, 1996). Under Pressure (Bowie and Dorsey, live, 1997). Under Pressure (Bowie and Dorsey, live, 2003). 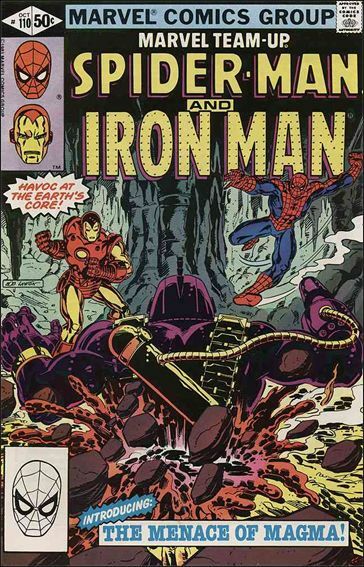 The comic book Marvel Team-Up (above is the first issue I ever bought, at age 9) had a simple narrative formula: in each issue Spider Man met another hero, usually fought him/her by mistake, then the two combined forces to defeat whatever villain turned up in the third act. MTU often felt like a make-work program for Marvel characters, as Spider Man’s co-stars were generally third-tier superheroes (or even TV actors), but once in a while there was an above-the-marquee pairing, a real event. A vague protest song about modern life, “Pressure” was recorded by an aging rock star and a fading rock group who met one summer in a Swiss studio. Bowie was there working with Giorgio Moroder on “Cat People,” while Queen was recording a follow-up to The Game. 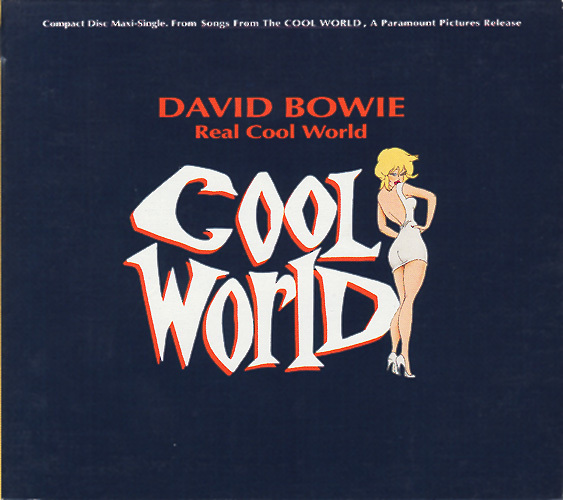 After chatting about record advances, Bowie recorded backing vocals for a dreadful Queen track called “Cool Cat” (his contribution was erased before the final mix). This led to a jam session on another unassuming song, provisionally titled “Feel Like,” that Queen was working up in the studio. With contributions by Bowie (who likely wrote the bridge melodies), the song developed into “Under Pressure,” which remains at heart a studio jam: Brian May’s guitar is little more than the arpeggiated pattern he was toying with on “Feel Like,” while Mercury’s peacock scatting in his verse sections disguises the fact that he didn’t bother to write a lyric for them. And for all its world-encompassing lyrical pretensions and its bravura vocals, “Pressure” is a fairly minimal record, in line with Queen’s new taste for simpler, dance-oriented sounds. Keeping within the confines of D major (until the second bridge, “Pressure” is just tonic (D), subdominant (G) and dominant (A)), “Pressure” is only two verses and two bridges, the second of the latter extended to become the grand climax to the song—after the final Bowie blowout, there’s nowhere to go but offstage. 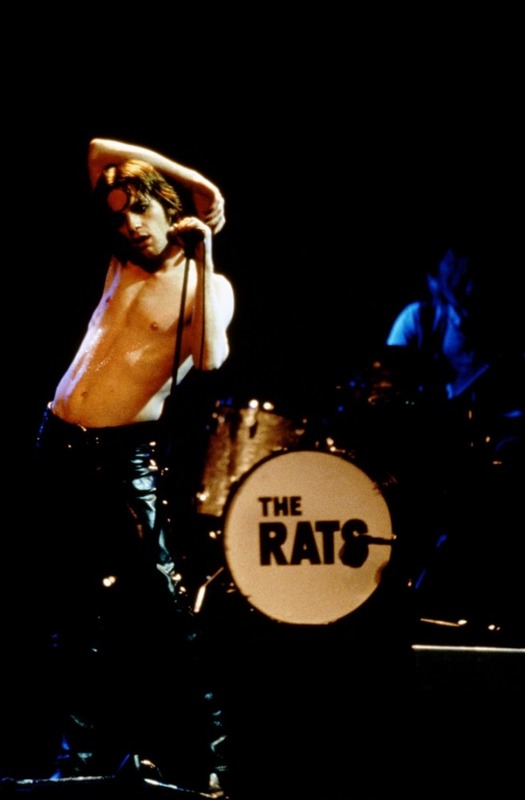 A few motifs are cycled throughout—the two-note synth line that sounds like a French horn (in the intro, verses and outro) and a two-note piano quote—and the rhythms build steadily, with the piano moving from brief interjections to a steady vamping in the verses, or Roger Taylor going from hi-hat in the intro to pounding his snare in the verses to the drum crescendo for Mercury’s bird of prey howls in the bridge (with Bowie yelling “no! no! no!” as though an air raid’s about to begin). 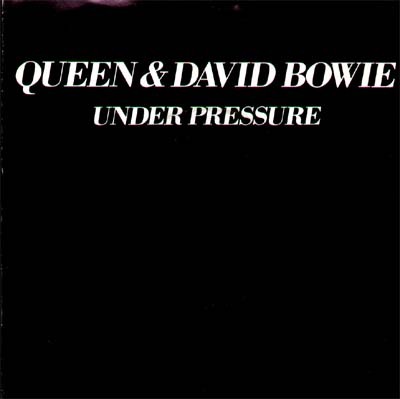 Neither Bowie nor Queen were enthusiastic at first about “Pressure,” most of which was completed in a day (then given some overdubs a few weeks later in New York). But “Pressure” had quite a few things in its favor, like its superstar co-billing and John Deacon’s minimalist bassline (six D notes, then an A; repeat, with minor variations, ad infinitum) which, especially when set against the bare-bones rhythm base in the intro (claps, fingersnaps, hi-hat), was a natural hook. ** And once EMI learned it had a Bowie and Queen duet, the label pushed for it to be a single. The once-David Jones and the once-Farrokh Bulsara first met in the late Sixties, when Bowie was an obscure would-be folkie and Mercury was selling second-hand clothes in a Kensington Market stall. 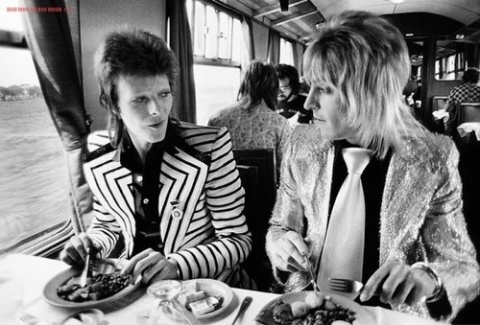 Little more than a decade later, after having become pop demigods and having lived on a galactic scale, Bowie and Mercury were the last glam superstars left standing. Meeting by chance at the turn of a decade, the two seemed compelled deliver a pronouncement, some kind of state of the union address. A problem with many rock star “social commentaries” is that the star, long isolated by money and sycophants, speaks in generalities, with human life reduced to a series of abstractions, as though the star’s fearful of alienating constituencies with an inappropriate detail. So we get things like: Feed the world. We are the world. People need to be free. 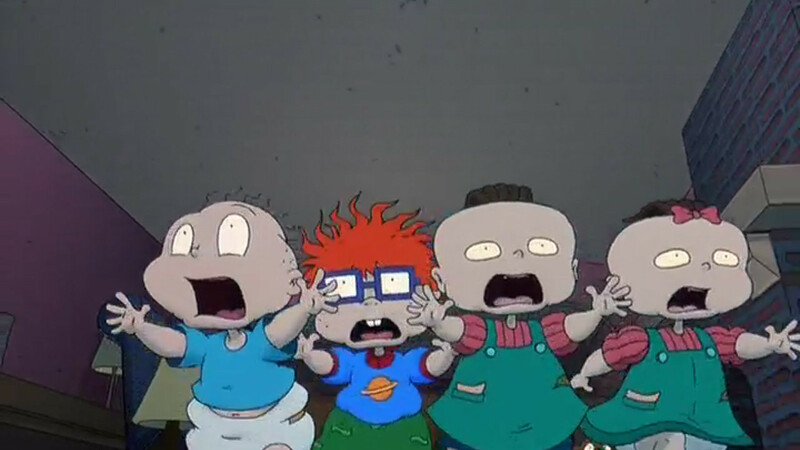 The children are our future. “Under Pressure” seems a case in point. People on streets, Mercury and Bowie sing, over and over again; it’s a phrase so abstracted that it lacks a definite article. “Pressure”*** is so ill-defined a concept that it’s both a physical force—burning buildings down—and a spiritual blight, causing divorce and homelessness. The brutal syntax of Bowie’s insanity laughs, under pressure we’re breaking doesn’t help things, while the song builds to the climactic flattery of Mercury’s why can’t we give ourselves one more chance?, offering unearned forgiveness for indeterminate sins. 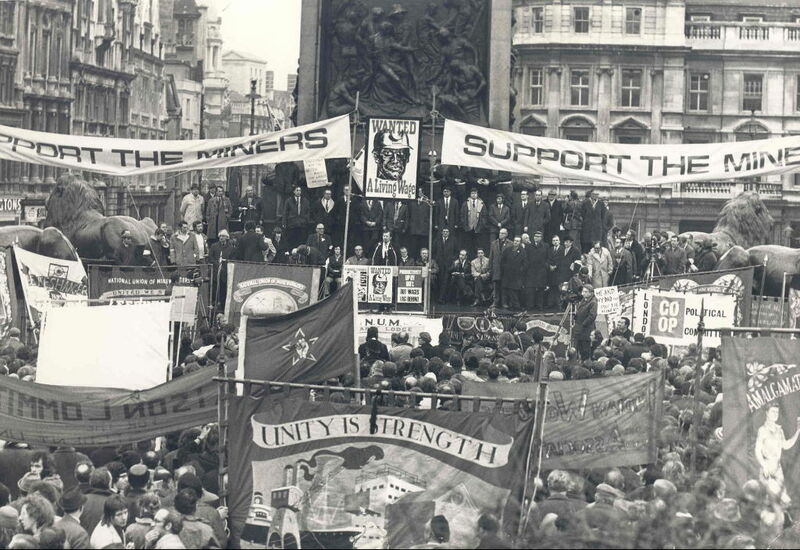 So it’s easy to ridicule the lyric as the gassings-on of two pantomime actors playing at being statesmen. That judgement would miss something essential, I think. Nick Lowe, in 1974, wrote a parody of the Last Hippie called “What’s So Funny ‘Bout Peace Love and Understanding?,” which Lowe’s protege Elvis Costello covered five years later. Lowe’s song is the lament of a hippie sad sack, lost in a cruel world and wondering where the good times have gone—there’s a touch of cruelty in it. Costello instead took the lyric utterly seriously, and the song, warming to its interpreter, became heartbreaking. “Where are the strong? and who are the trusted?” became hard indictments, questions more relevant than ever today. Something similar happens in “Under Pressure,” which is a sad hippie song beneath its arias and cannonades, and it’s owed entirely to its singers. Bowie and Mercury simply will “Under Pressure” into being far better than the material deserves. Take how Mercury sings the cliche “it never rains but it pours,” in an impossibly light falsetto, making it sound like a lament for the world, or how he soars to the diva high note that even Annie Lennox would struggle to hit. It’s a man carving his own monument. But (given our biases here, this should be no surprise) it’s Bowie who really salvages the song. The sudden ferocity of his appearance on the first bridge (“it’s the terror of knowing what this world is about“) dispels some of the vagaries of the verse. 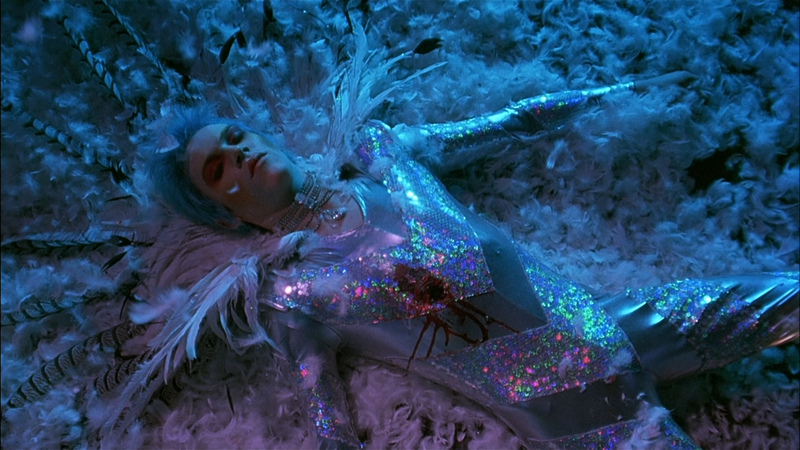 Then there’s Bowie’s crescendo performance in the second bridge. It’s a melody that Bowie’s held back until now like an ace of trumps, the magnificent staircase-climb of “love’s..such an..old fashioned…WORD/and love..DARES YOU to CARE FOR…” It’s a beautiful moment: in the middle of what has been a superstar jam session, there suddenly appears Bowie’s new hymn for all the young dudes, buried away in plain sight. Watch George Michael start singing along in awe during Bowie’s rehearsal performance at the Mercury tribute—he can’t help himself. “Under Pressure” is a day’s indulgence by two men past their prime, who were entering a decade that would reward and diminish them; Mercury had only a decade more to live. So there’s a sadness along with the bravado, a sense of loss to go with the heroics. 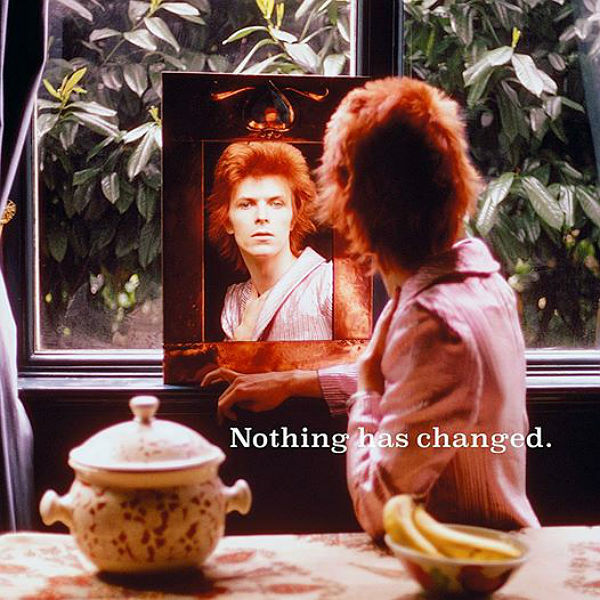 Something is going away, going away for good, and Bowie and Mercury see it, if only in shadows. Anthony Miccio once called “Under Pressure” “the best song of all time,” and there are a few days when I think he was right. It’s the last song of the titans, one that needs grandiose claims made on its behalf. 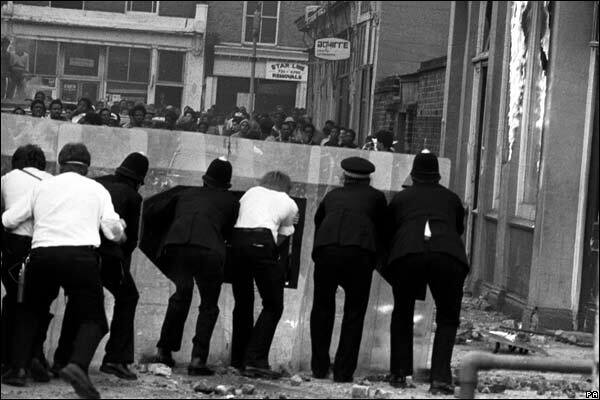 “Under Pressure” slipped out in late 1981: a collective anonymous act. 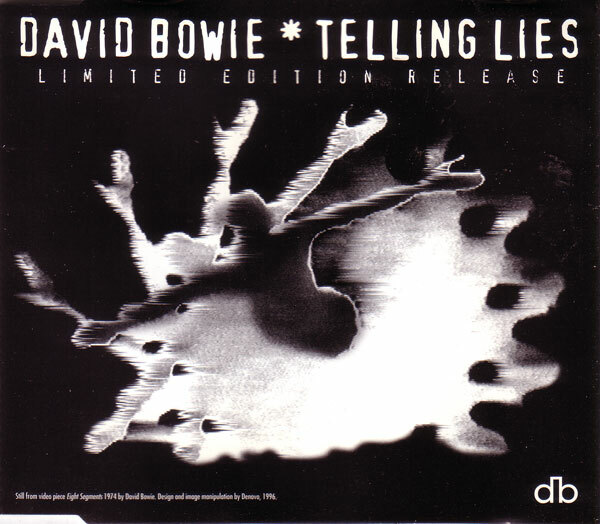 The single sleeve had no photographs, its video was cobbled together by David Mallet from stock footage, Queen and Bowie never performed it live together and never gave a single interview about “Under Pressure.” And it hit #1. 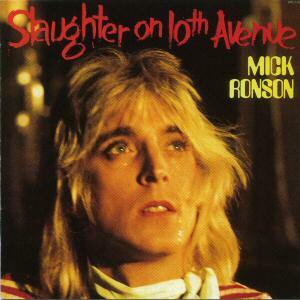 Recorded July 1981 at Mountain Studios, Montreux, with overdubs a few weeks later at the Power Station, NYC. Released 26 October 1981 as EMI 5250 (#1 UK, #29 US); later on Queen’s 1982 Hot Space, as well as being collected in a few Bowie anthologies. 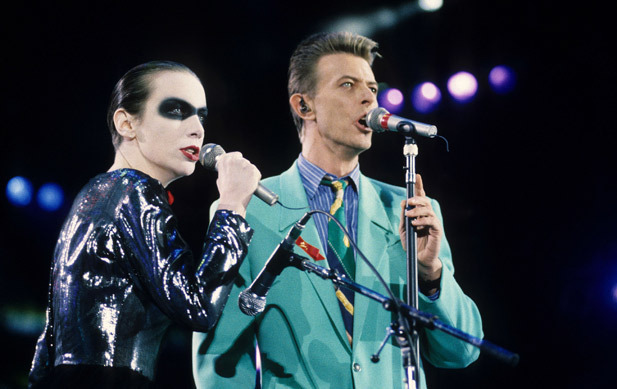 Bowie never played it live until the tribute to Mercury in April 1992, with his grand duet with Annie Lennox. Bowie then fashioned “Pressure” into a duet that he would perform with Gail Ann Dorsey throughout his last decade of touring. 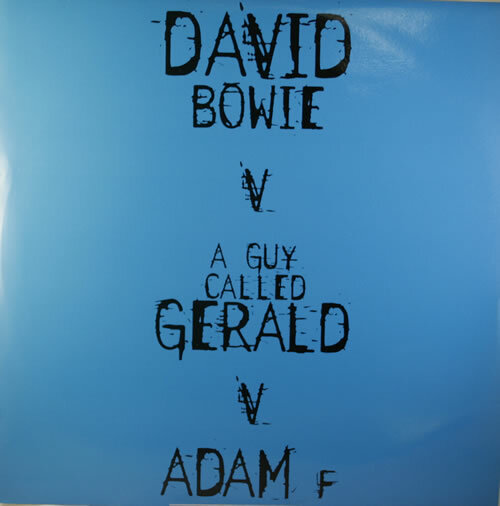 * Of course, there’s another edition of Bowie Team-Up coming in 1985, one that’s far less sublime. Brace yourselves. *** See also Billy Joel’s even more incoherent “Pressure,” from 1982. 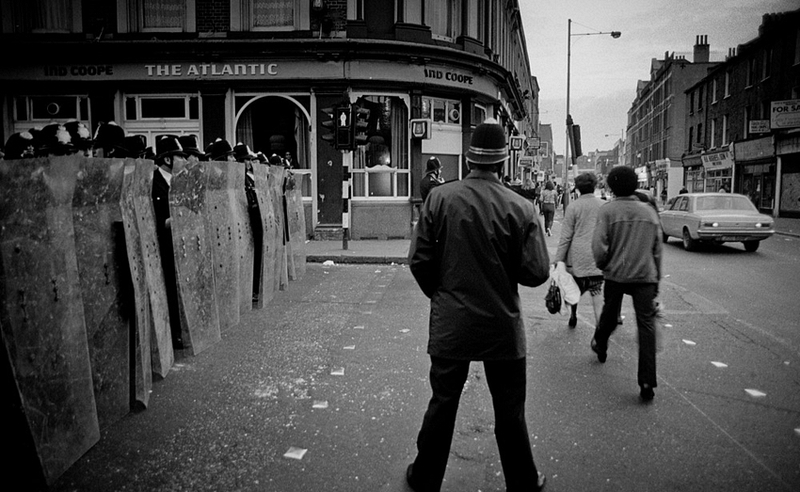 Top: MTU #110, Oct. 1981; Kim Aldis, Brixton riots, UK, April 1981. Lodger is the last and arguably the most neglected of Bowie’s ’70s records. “A certified nonclassic,” Robert Christgau once called it. Bowie and Tony Visconti both have said they regret how it was recorded and mixed, while its performers, like Carlos Alomar, have described its production as being frustrating at times, with Brian Eno’s attempts to upend the sessions more irritating than inspiring. Lodger‘s forcible inclusion in a so-called trilogy with Low and “Heroes” hasn’t helped its reputation,* as it has little in common with those records and so winds up being the Godfather III of the lot. While its cast of characters—Visconti, Eno, Alomar & crew—is mostly the same as the other “Berlin” records, Lodger mainly was recorded in a cramped, overheated studio in Switzerland, rather than in a haunted French castle or in walking distance of the Berlin Wall. And where “Heroes” and Low had been cut fast, in under two months, Lodger was a more leisurely affair: the backing tracks were cut in September 1978, while vocals and overdubs weren’t finished until March of the following year. 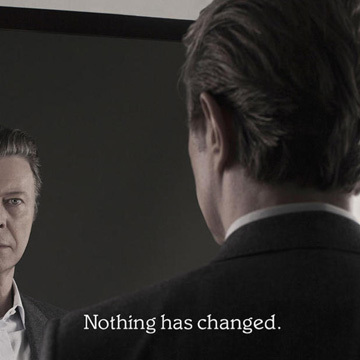 However, considered on its own terms, as a transition LP overflowing with ideas, some fine, some kooky, Lodger has its rewards; the songwriting is still inspired, the playing is strong and there’s a sense of what-the-hell adventurism to it all—“African Night Flight” and “Yassassin” are some of the weirdest things Bowie had ever recorded. And beneath the official narrative of the record, of Bowie as world traveler, sampling various “ethnic” musics with little vérité (it’s the sort of album where the white musicians had to teach the black ones how to play reggae), lies a more acute one: when you become an influence, does that make you obsolete? Lodger is Bowie, at age 32, trying to come to terms with being “David Bowie,” inspiration to a horde of new bands. There’s a line from Updike’s Rabbit, Run that applies: the kids keep coming, they keep crowding you up. Bowie, touring throughout 1978 and sampling the new scenes in London and New York, could see the kids coming, and it unnerved him as much as it flattered him. 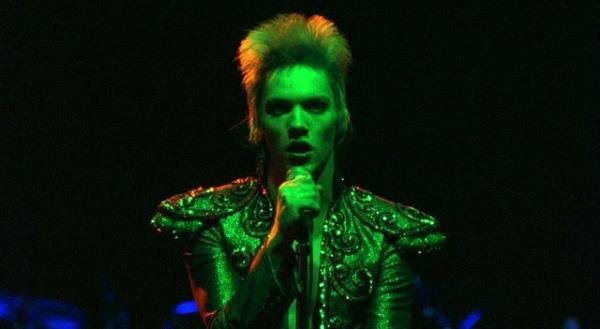 His past was being disassembled and used for parts: the Cuddly Toys took Ziggy Stardust, as did Bauhaus, who also drew from Man Who Sold the World; the soon-to-form Duran Duran would feast on Young Americans, while Gary Numan seemed to have stolen a set of “Heroes” outtakes. (Numan in particular rubbed Bowie the wrong way, with Bowie allegedly having Numan kicked off a TV show that the two were slated to appear on together). 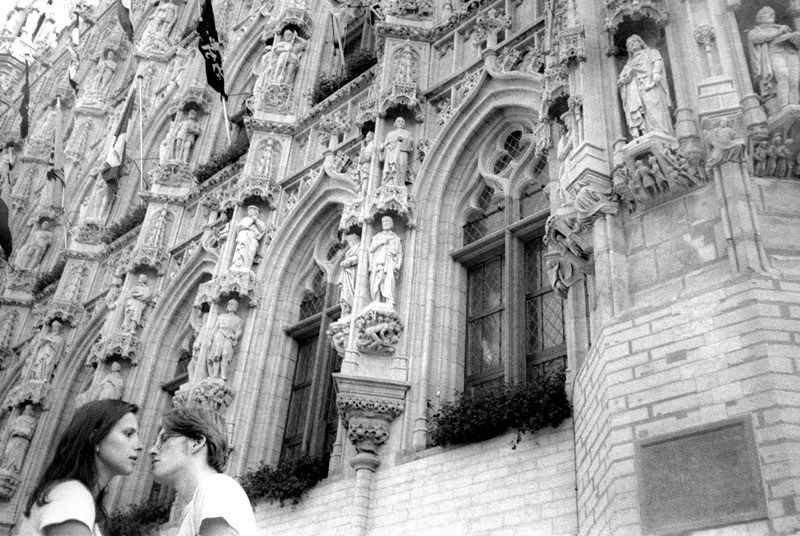 “Move On” is a travelogue whose lyric was inspired by Bowie’s recent journeys to Kenya (on vacation with his son), Japan and Australia; it’s also a record of a man fearful of being trapped in the past and, more pressingly, himself and so he pushes onward, without a plan, and with only vague fantasies to guide him. 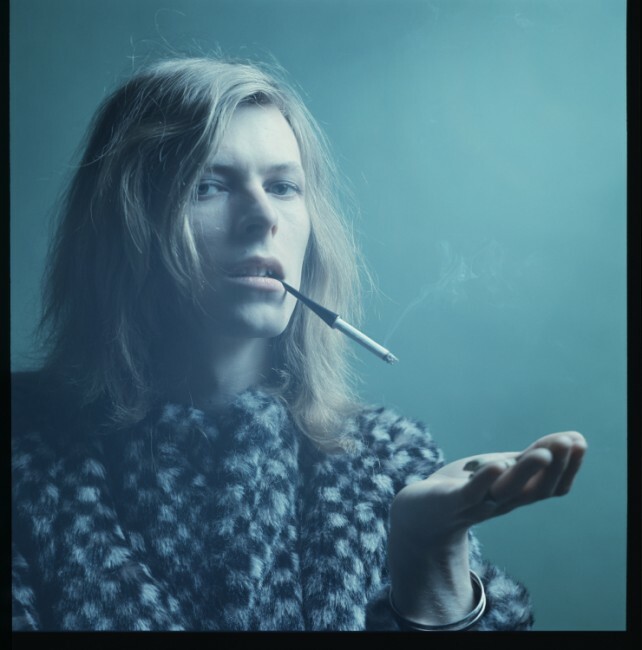 “Feeling like a shadow, drifting like a leaf,” Bowie sings as the song winds out; a new territory exacts a harsh cost. The song, in D major, consists of a verse, two choruses and a bridge, along with a hybrid instrumental section that’s half a verse plus a full chorus (a quick A-C-G progression usually serves as the scene-changer). 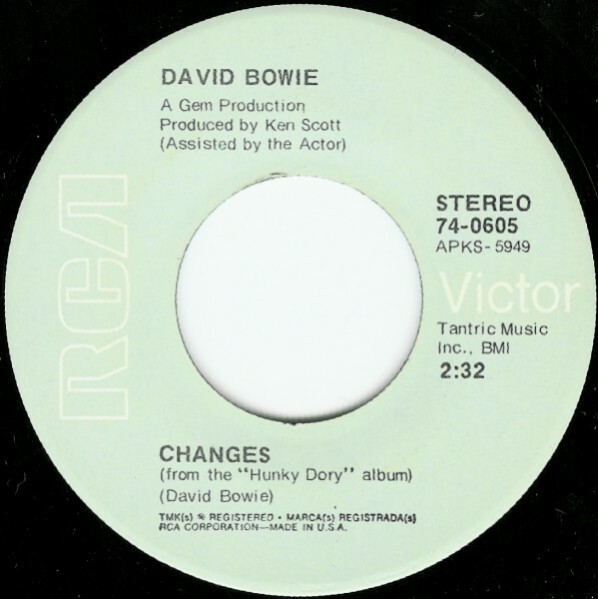 The 18-bar verse, which opens the song, is restrained in tone, with Bowie keeping to a three-note range at first and always closing phrases on the root note, D (on “feel,” “move,” “train”, etc.). Carlos Alomar plays a simple riff that fills each vocal pause, while Dennis Davis provides a rumbling counterpoint on toms (he keeps the pattern going throughout the track), with fills at the verse’s midpoint and close. So Bowie’s vocal, which is caged in the verse, meanders through the choruses (which, starting with “somewhere someone’s calling me,” is the inverted chord sequence of C/F/G/A minor/D/B minor)—he sings the vocal over seven phrases, each of which differs in length and in notes. The bridge (“Africa is sleepy people”) is equally roaming and random, with a lyric lacking rhymes and which scans oddly. It suggests a song that’s gone out of phase, with bars of 2/4 time (on “matted” and “place like”) further unsettling things. George Murray’s bass, kept low in the mix, is the track’s secret melodist. Recorded September 1978 in Mountain Studios, Montreux, Switzerland and March 1979 at Record Plant Studios, NYC; it was the B-side of “Ashes to Ashes,” September 1980. It’s never been performed live, the same as nearly half the Lodger tracks. * Bowie, not critics, is to blame here, as he was calling Lodger part of a “triptych” soon after it was released. 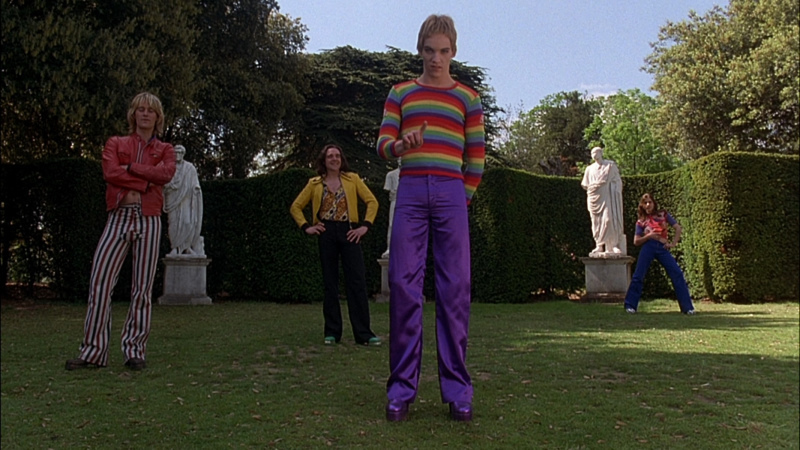 Eno also referred to the records as being a trilogy around the same time. 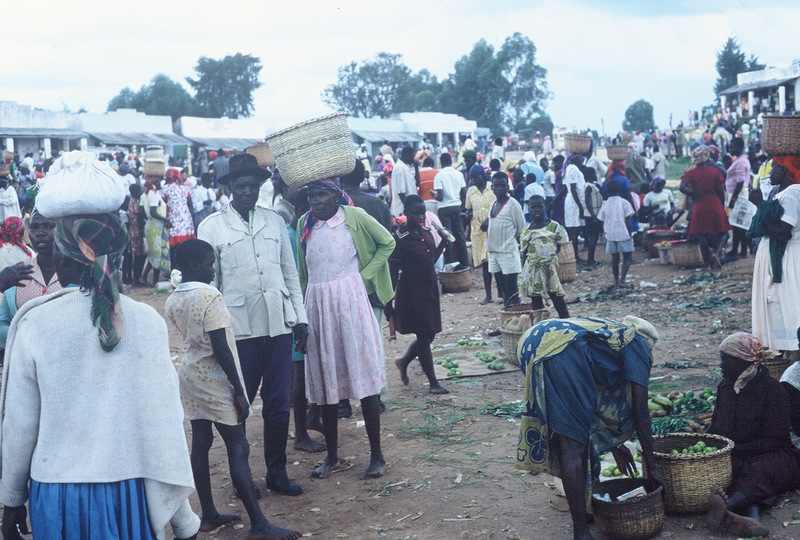 Top: Ted Bobosh, “Market Day, Western Kenya,” 1978. 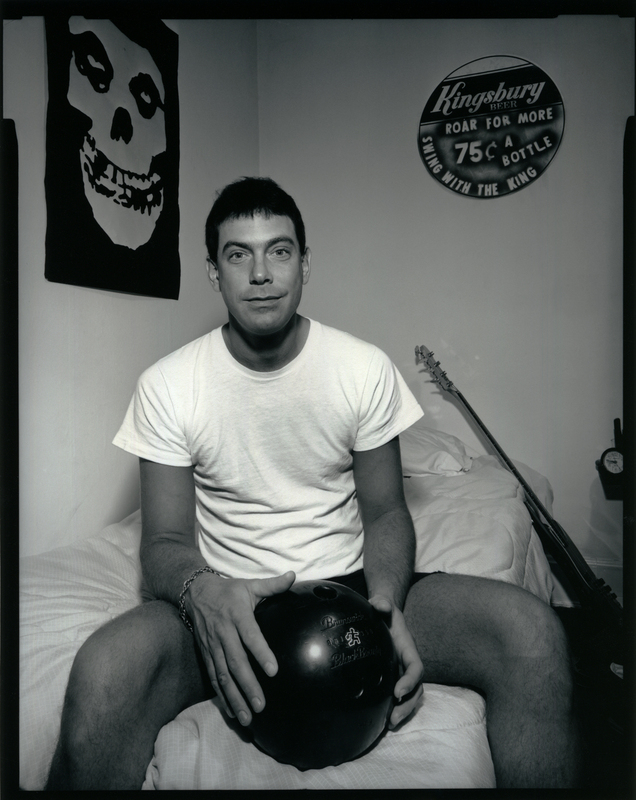 You have searched the Pushing Ahead of the Dame blog archives for ‘all the young dudes’. If you are unable to find anything in these search results, you can try one of these links.